This costume is an original design inspired by the legendary herbal elixir, Absinthe. The drink has a long history among famous artists as both a muse and a falsely reported source of insanity. This gown will be customized just for you. I will contact you with a questionnaire to answer regarding measurements and size, sleeve and skirt style preferences, and much more. The gown pictured starts with spaghetti straps that are beaded to look like sugar cubes, a standard part of pouring Absinthe. 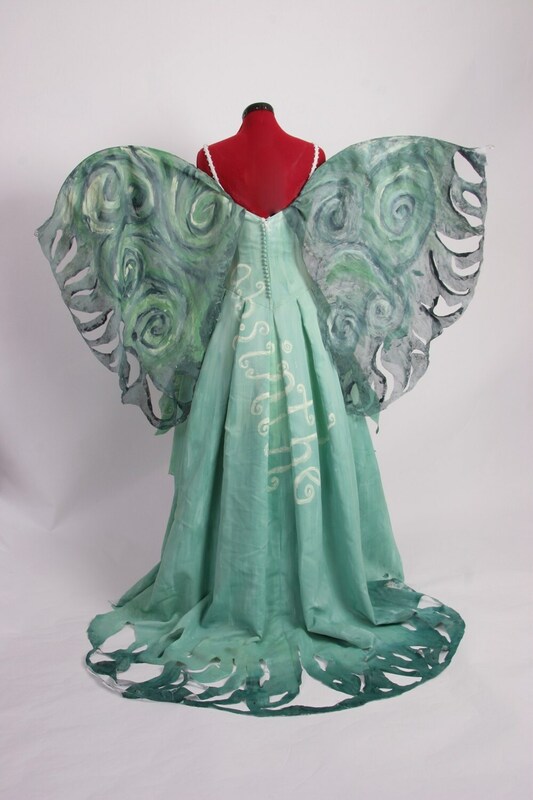 It features a satin bodice painted "Absinthe" green which starts at the top with sugary beads and a pale, whitish green that gradually darkens to a deep green train. The skirt of the dress is pleated satin that is short in the front with jagged edges and drops to a chapel length train in the back. The front of the bodice feature pale, curled letters that say "La Fee Verte" (The Green Fairy in French. ), a commonly used term in reference to Absinthe. The back of the skirt features the same style letters spelling out "absinthe." The train of the gown looks as if the sugary elixir has dripped and puddled to the ground. A true conversation piece, you will connect with the most interesting people at the party in this gown. Those familiar with Absinthe will seek you out and those who aren't familiar with it will follow you until you explain the significance. Even without the familiarity of "The Green Fairy," this costume is sure to bring more attention than any costume in the room. The shades of green dripping through the dress and swirled throughout the wings are exquisite and so flattering on anyone! The lettering is just enough to add a unique flair to this beautiful fairy gown. The wings are sewn into the dress so no need to worry about straps or attachments. The dress pictured is merely a representation of the dress that you will receive. The possibilities for a custom version of this costume are endless and I am more than happy to work with you on your own, unique version. Please allow 4-6 weeks for completion of this dress.